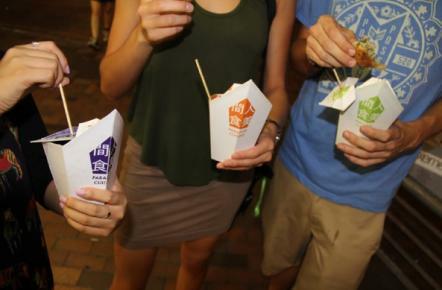 A group of art college students from Savannah, Georgia came together during an overseas study trip to Hong Kong and revolutionized the world of street food vending. 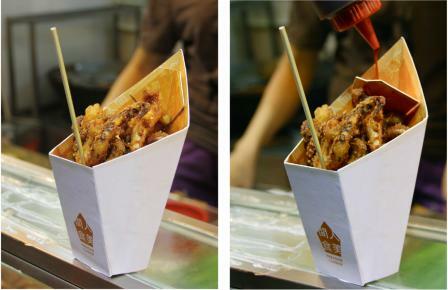 Their intricate design makes street food consumption so much better on all possible levels—from its playful and interactive style to its extremely brilliant convenient structure. It really doesn’t get much better. Although the concept was developed in the middle of last year, it only went viral this summer when the team received an offer to work alongside a major manufacturer in Hong Kong, giving them the opportunity to bring the concept to production. The team is currently evaluating production costs and logistics to assess the possibilities of moving forward within the market. The project team, led by Taylor Kuzma, who is from Tampa, Florida, consists of a mix of two industrial designers and two service designers: Taylor Kuzma, Camille Myhre, Ian Nott and Ji Won Yeom. All four members were attending the Savannah College of Art and Design in Savannah, Georgia, when they decided to do a five-week study trip attending the Hong Kong counterpart of the college. Under the supervision of Professor John McCabe, the team was engaged by a Design & Emerging Materials Studio class to come up with the project. The group shared the same findings, and therefore came up with a design that could potentially play a huge role in improving the street-food industry. 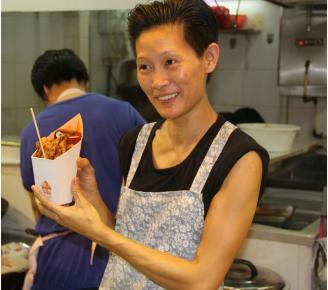 Although it started as nothing more than a conceptual project, the team built functional versions of the product and took them to the street vendors. Taylor said that it really did not take much for them to light up with excitement and wonder, and before they knew it, the vendors were already interested in the innovative packaging! Due to lack of time, the team was yet able to do a thorough research into the cost of production for bamboo pulp and its capabilities with form. “But from our initial research, it did not seem like bamboo production was more expensive than current paper and plastic products,” Taylor said. Bamboo pulp offers an economic solution to manufacturing paper products as it yields up to five times as much pulp when compared to northern softwoods and requires switching no costs. Soy ink is environmentally friendly, offers much more vivid colours, and makes it easier for printed paper to be recycled. The team started with an initial round of concepts to explore all the possibilities and to see which directions were the strongest. It had to be practical, but at the same time the design had to be playful and interactive. “This path brought us to some great concepts which would allow the user to interact with the product, having pieces which could rotate, tear off, clip on, to reveal which type of meat, vegetable or noodle/rice you had ordered from the street food vendor,” Taylor said. 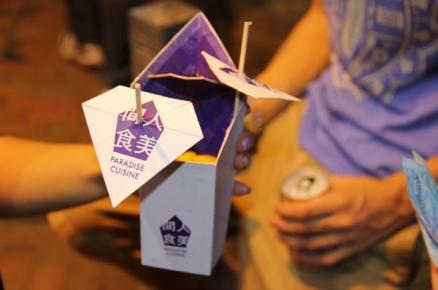 Their (brilliant) final design drew on the street-food culture of having sauces and dips. “From our observation, as you pour [the sauce] in and walk away, the sauce is drained to the bottom of your cup and sitting in a pool by the time you start eating it,” Taylor said. For more information, please click here and support this amazing new product!